We got a quick update on off-season improvements from Tom Tar, the general manager at Belleayre Ski Center. Snowmaking: We replaced four submersible pumps that supply our water. We’ve also replaced 9,000 feet of air and water lines that will allow us to increase water pressure and further improve our efficiency. 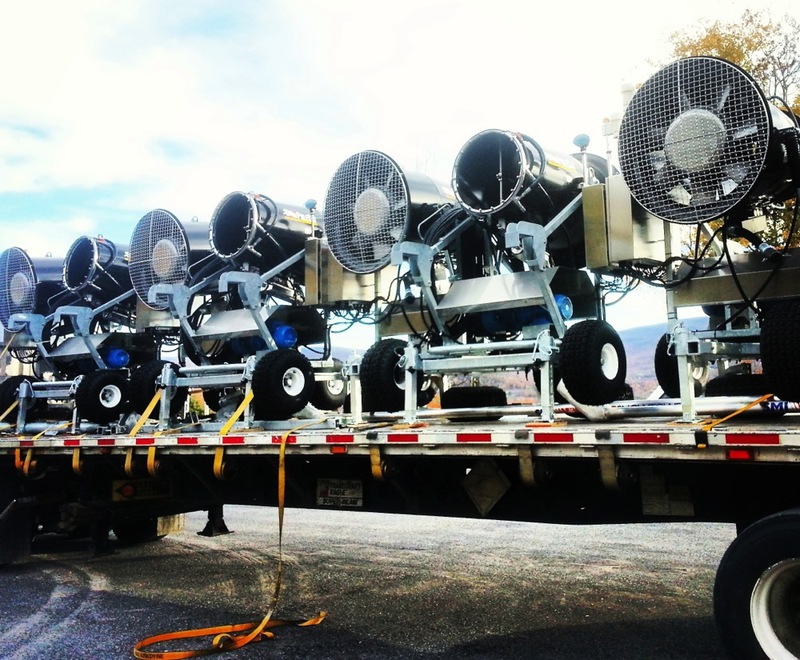 We added 25 low-energy guns including ten new SMI Polecat Fan Guns that will further increase our snowmaking capabilities and energy efficiency. Lifts: We’re replacing the handle tow (Lift #5) on the bunny slope with a magic carpet. The new lift will be ready for opening day. Gear: We will have a new rental fleet of new skis and snowboards. As part of ORDA, it’s likely that our rental fleet will be similar to those at Gore and Whiteface. Renovations: The Discovery Lodge is currently being upgraded. The cafeteria style food service has been replaced with a more modern food court with an enhanced menu and more space for additional seating. This should also help with the flow of customers and alleviate the some of the lines/bottleneck at the cash registers. Ski School: We’re introducing a new adult race program. The ten-week program starts January 4, 2014 and is similar to the children’s race program but geared towards the 20+ crowd. Structure to handle newcomers or those with race experience, our coaching staff is PSIA and USSA certified. Our focus will be to develop race skills, technique and tactics that serve the skier well in all conditions. How does this off-season compare to those pre-ORDA? ORDA has invested in Belleayre at a level that is allowing us to get a lot done this off-season including both The Discovery Lodge Renovation and the installation of the Magic Carpet. We have been hitting the show circuit again — a group show in NJ and PA, a couple of local shows, Adventures NYC, Albany Ski and Snowboard Expo, NYC media night, Mount Everest at Giants stadium and some others. We’ll be out there this year with a stronger marketing program too. Of course, we have the SKI3 products that are new this year: season passes and frequent skier cards. There may be more, but that’s all I can give you right now. It is good to see Belle finally getting some much needed upgrades. The food court will be a great addition.